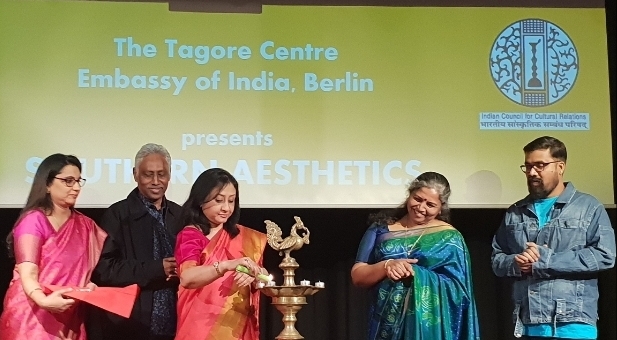 The Tagore Centre, Embassy of India, Berlin hosted an exhibition of Indian paintings and sculptures from Southern states of India titled ‘Southern Aesthetics’ on April 03, 2019 at the Auditorium in the Embassy. 2. Curated by Mrs. Deepa Seetharam, Founder, ARTsmart - the exhibition ‘Southern Aesthetics’ featured works by eminent artists - Mr. Vasudevan Namboodri, Mr. C. N. Karunakaran, Ms. Devi Seetharam, Mr. Subramanian Gopalswamy, Mr. K. R. Santhanakrishnan, Mr. Suresh Muthukulam, Mr. P. Gnana, Mr. A. V. Ilanago and Mr. V. Satheesan. 3. The works on display featured varied subjects ranging from an artist’s representation of the human form caught in a dramatic moment of action to figurative portrayals of social issues to the nostalgic images of courtyards to traditional female figures, all blending seamlessly into the idea of ‘Southern Aesthetics’. 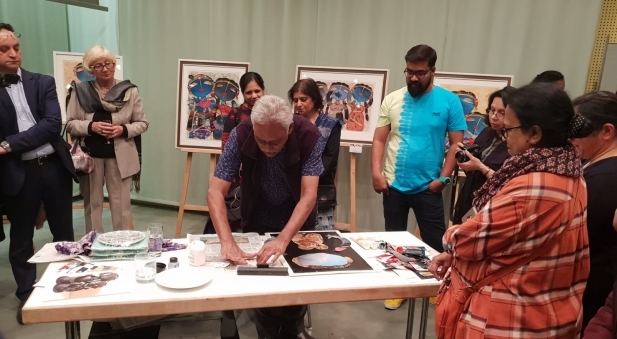 Mr. Subramanian Gopalswamy also hosted a live demonstration session on his collage style of art for the audience. 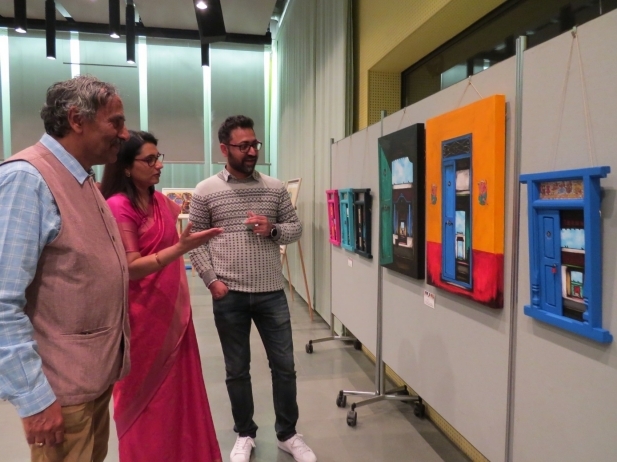 4.The exhibition was inaugurated by Ambassador of India to Germany, Mrs. Mukta Dutta Tomar. In her remarks Ambassador Tomar appreciated the broad range of impressive contemporary art works on display that offered curated insights into the cultural landscapes of India. In this context, she also referred to three excellent art exhibitions of contemporary Indian artistsheld in Germany in the recent past - ‘Facing India’ at the Kunstmuseum, Wolfsburg; Mr. Vivan Sundaram’s work at Haus der Kunst, Munich; ‘Hello World: Revising a Collection’ a collection of more than 200 works from all over the world curated by 13 international curators which included Ms. Natasha Ginwala’s curated works on Indian modernism. 5. 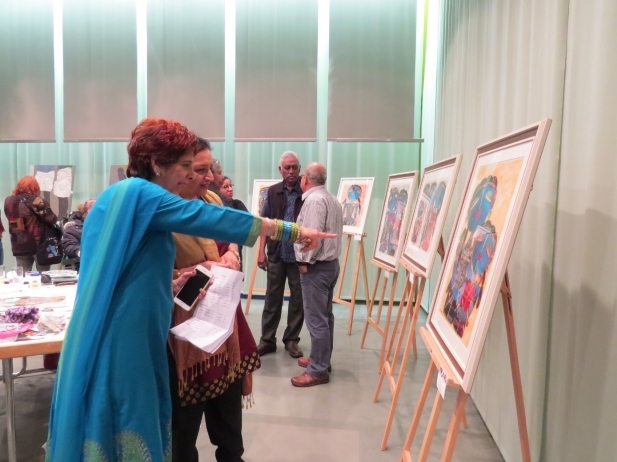 The exhibition was attended by local dignitaries, diplomats, artists and curators, representatives of galleries and members of the Indian community. 6. 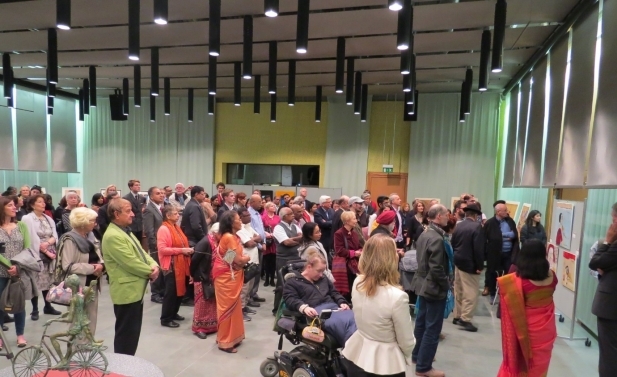 A few photographs of the event are enclosed for use (by acknowledging the Embassy as the source).